Will Family Albums Be a Thing of the Past? Several years ago an instructor for the photography class I was taking expressed concern that a whole generation of photography would eventually go missing. His thought was that right now, in this age of digital photography, we are still new enough to the concept that we are not taking care to preserve our images. In the future however, people will realize what’s been lost and they’ll take specific measures to once again produce hardcopy photos. He’s right, you know. I’m a perfect example. 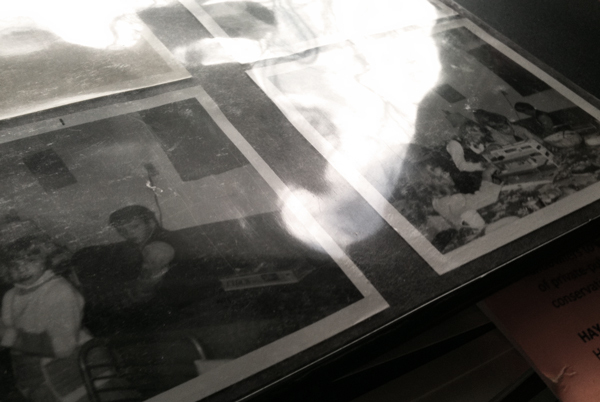 I put together photo albums for my family up to the late 1990s (albeit in great need of organization). Somewhere after that I went digital and no longer had them printed. Oh, I always mean to. But year after year goes by and I add hundreds of pictures to my computerized stash, yet I fail to make hardcopies. At any given time, my technology could fail and I could easily loose these irreplaceable family treasures. Does posting pictures on Facebook count? Or in a blog? Some say our photos are safer online than in the old-fashioned photo album. But there’s something to be said about sitting down with a tangible timeline of one’s beloved family. There’s joy in turning the pages of an album—those plastic sheaths that archive the pieces of our lives. Somehow the pass of a finger across a digital screen just doesn’t compare. We don’t have a lot of pictures of the Amos boys when they were young. Those we do have are so very, very special. We’re lucky Gladys and others took the time to shoot those photographs—it certainly was much more expensive then than now—and we’re lucky they cared enough to save them for us. Here are good suggestions for preserving family photos and data (click here). Do you have more ideas to add? How can we make sure the pictures we take today will be there for our grandchildren and their children? This entry was posted in Genealogy, History by adunate. Bookmark the permalink.